This year marks the 30th anniversary of this iconic event which involves solar powered vehicles travelling from Darwin to Adelaide. This year a field of 42 solar cars and teams from around the globe, across three design classes will compete in the challenge. 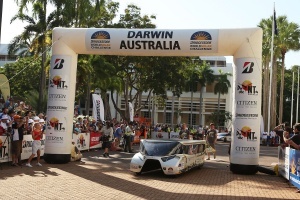 The Department of Infrastructure, Planning and Logistics, Road Vehicle Standards Unit for Compliance, are tasked with assessing and inspecting the vehicles at the pre-event scrutineering from Monday the 2nd of October at the Darwin Convention centre. Brake and stability testing by the team will be done at Hidden Valley Raceway before vehicles are granted conditional registration by Motor Vehicle Registry to participate in the event. All vehicles participating in the event are required to comply with NT road law including speed limits.